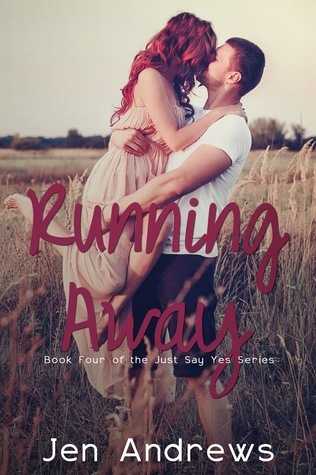 May I know who or what was your inspiration in writing the fourth book of Just Say Yes series: Running Away? Did you experience the same kind of thing Teagan/Jeremy has been through? Jen: No, not at all. I’ve been married for 17 years and never had any crazy ex issues. Can you tell us more about the cover of Running Away, and how did you come up with it as well. Jen: To me, covers speak a thousand words. I always choose my own cover photos to represent a part in the book. With Running Away, as soon as I saw the picture, I fell in love with it. With some creativity from my cover artist, she removed the flower headband the woman had been wearing originally and changed the color of the model’s hair to Teagan’s fiery red. The bad part was, I had no scene in the book that fit the cover photo! So, I wrote one in. The scene takes place where Jeremy and Teagan are on their way to meet her grandmother and they stop at the small lake. I’ll just leave it at that to avoid spoilers. What is the hardest thing you’ve experienced/encountered while writing Just Say Yes series? Jen: This is an easy answer. The first three books were all written as one very large book. I never intended to do a series, but when I finally typed “the end” it was almost 200,000 words. That’s the size of three novels. This forced me to split the book into three. Which meant several re-writes of certain scenes, and two cliffhangers. As soon as I finished splitting the book, I sent it them off to about 6 friends to see what they thought and then started on Jeremy’s book. I never intended to publish any of the books so they sat on my laptop from early 2013 until early 2014. I was finally convinced to publish and found people to help me get things moving. Let’s talk about your style of writing: do you write based on your feelings/emotions, or is it based on objective ideas or both? Jen: Both. For the first 3 books, I had a timeline, scenes written down, and all kinds of ideas. I wrote in a person who I’d never planned on, because she kept screaming at me that she would be the glue that kept Andy and Zoey together. She’s a sweet little thing, but she sure let me know that she wanted a say in what I did. Her name is Hannah. How do you deal with this so called ‘writer’s block’? Have you experienced it? Jen: I am actually going through something similar right now. Because I wrote the JSY series so close together, and then concentrated on releasing them in a timely manner, I haven’t actually written much since I finished the original version of Running Away back in early 2013. I’ve got a few chapters done on a new project, and an amazing story to tell, so I am hoping that by joining the NaNoWriMo challenge in November, I will get myself in gear and get my 50K words written. What are your preferred genres when writing? Jen: I write contemporary romance, but I like to keep things realistic. Or as realistic as possible. My characters are normal, everyday people. Do you read much outside of the genre you write? Jen: I pretty much stick with the romance genre, but I love books that will get me thinking and blow my mind. I have a few go-to authors who’ve written books that have completely floored me. Amy Harmon, Courtney Cole, and Lindy Zart. Probably the biggest step outside my genre is author Ruby Merritt. She writes western historical romance and is an amazing storyteller. Which do you prefer: Paperbacks or Hardbound? Physical book or Ebook? Why? Jen: I have well over 2500 e-books so they are my preferred method of reading because they take up no physical space. But, I do have several hardcovers and paperbacks as well. I have my bookshelf in my office dedicated to all of my signed books. Jen: LIVE IN THE MOMENT. What is your favorite inspirational quote/phrase? Jen: I have one inspirational and one that is a phrase. Inspirational: What if I fall? Oh, but my darling, what if you fly? Phrase: There isn’t a particle of you that I don’t know, remember, and want..
What advice can you give to the aspiring writers out there, especially the young ones? Jen: NEVER GIVE UP. Never delete anything!! If it’s not working, cut it and set it aside on another document and save it. You might use it later, or in another project. Don’t take shortcuts. Find an editor, cover designer, and formatter that you mesh with. Always remember that this is your book, but sometimes people see things differently and give great feedback. Don’t be afraid to change something. It’s hard to accept constructive criticism sometimes, but it’s so necessary.